1791 Gunleather is synonymous with high-quality leather. Our 100% Certified American Heavy Native Steerhide, double-reinforce-stitched by fourth generation artisans, surprises and delights gun owners across the United States who are amazed by what they get for the low price. 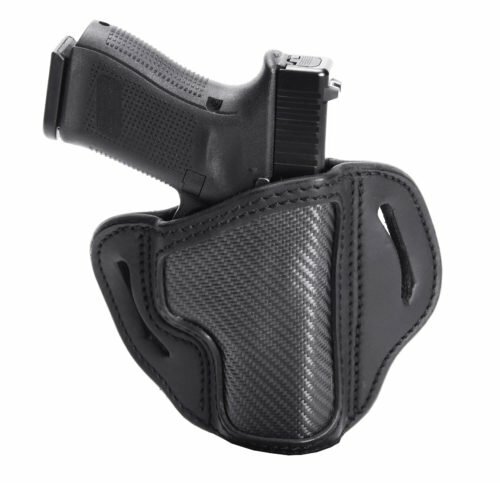 While most people will only carry in leather, there is a growing number of professionals who prefer a carbon fiber holster – particularly when carrying on duty. A carbon fiber gun holster won’t warp when left on a hot dashboard, won’t scratch when navigating through brush, won’t shrink in water, and won’t become brittle in sub-zero temperatures. When you need a gun holster that’s tough-as-nails, only the Project Stealth line will do. 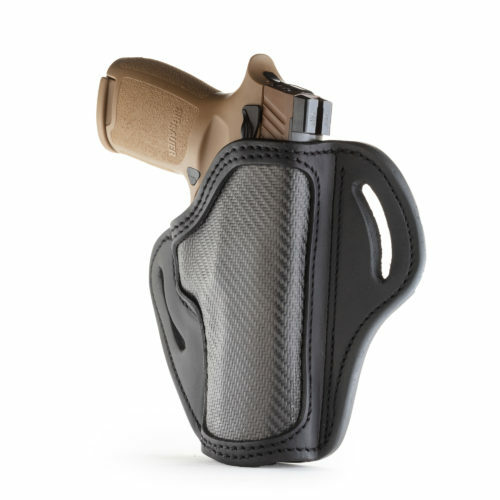 Project Stealth launched in 2018, offering the first true leather and carbon fiber OWB holster on the market. Stealth products incorporate leather into the belt loopings, and a blend of leather and carbon fiber into the actual holster. Our carbon fiber holsters are not just styled to look like carbon fiber or carbon fiber coated; they are actually BONDED to the leather through a high-tech process that makes the material stronger and able to withstand a beating, whether through heavy use or harsh environmental elements. Our Project Stealth carbon fiber pistol holders are designed with police officers, security guards, federal agents, and soldiers in mind. Even if you’ve had a carbon fiber holster before, you’ve never had carbon fiber like this before. As with our topmost-quality leather, you can expect the highest-quality carbon fiber used in our carbon fiber handgun holster. Carbon fiber in general has the highest tensile strength of any commercially available fiber. Going above and beyond, 1791 Gunleather uses only American-made CX6 carbon fiber manufactured by Carbitex. 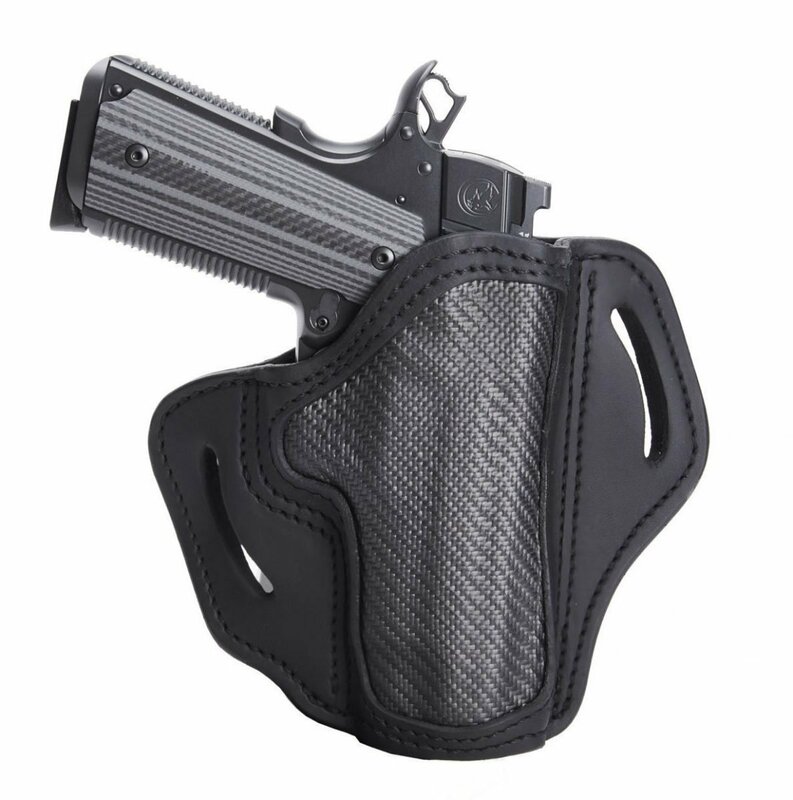 The CX6 is an exceptionally flexible form of carbon fiber that performs well in applications like holsters, footwear, sports equipment, and luggage. Unlike unyielding forms of carbon fiber that may damage your weapon with its rigidity, the CX6 is soft to the touch, comfortable, and undeniably sophisticated. You’ll note there are at least four different models of carbon fiber gun holsters on our Project Stealth page. These products all come in Stealth Black for right-handed shooters and OWB applications, but vary based on the make and model of your handgun. 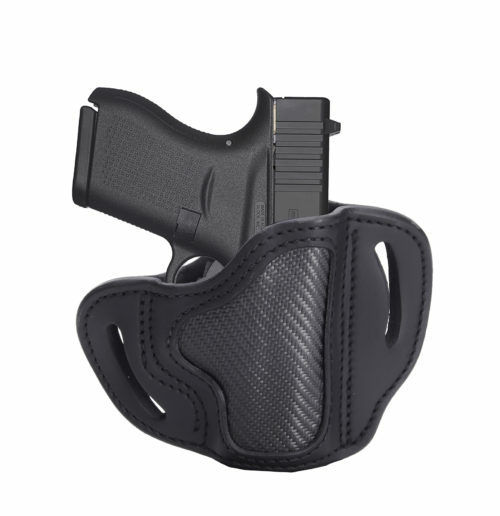 For instance, we offer a carbon fiber Glock holster fitted to the Glock 42 and Glock 43 (that also works with select models of Bersa, Colt, Kimber, Ruger, and Sig Sauer). We also have holsters that accommodate the wider grip and heavier frame of a Glock 17 or Walther P99, larger holsters suited for the popular S&W MP40 or Springfield XDs, and compact holsters for your five-inch Browning or Colt 1911. 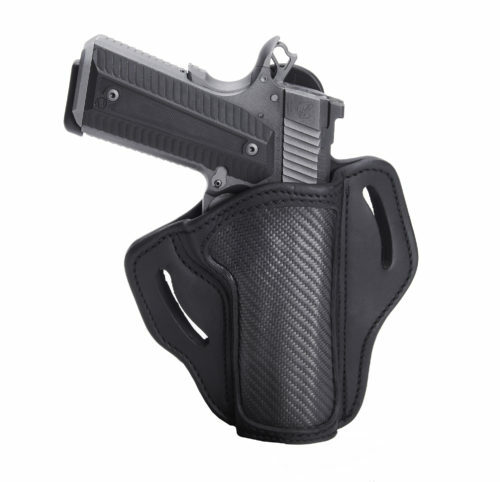 Contact us if you have any questions about finding the right fit black carbon fiber holster. Why Buy A Carbon Fiber Holster? Why Choose Between Carbon Fiber vs. Leather Holsters When You Can Have It All? 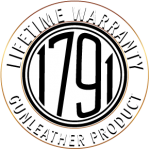 There’s a reason you’ll find 1791 Gunleather products at more than 1,200 dealers across America. We believe in good old-fashioned values like sourcing materials in the USA, employing craftsmen who are experienced masters of their trade, improving upon existing designs on the market, and going the extra mile for our customers. No matter what type of holster you buy, you can expect responsive customer service, hassle-free returns, and a lifetime warranty on craftsmanship. Shop 1791 Gunleather holsters to protect your prized firearm.